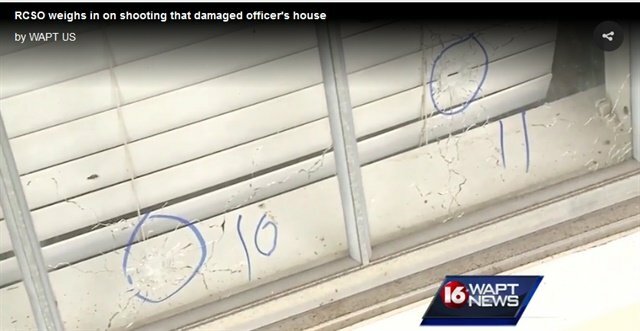 Rankin County, MS, Undersheriff Raymond Duke called whoever shot up a Pearl police officer’s home earlier this week “cowardly punks who committed a ‘hate crime’” against the officer in a Facebook post. Pearl police officer Alfred Jenkins’ home on Dardanelle Drive in south Jackson was shot up about 1 a.m. Wednesday, authorities said. More than 30 bullet holes were left in the house, from what police said were a rifle and a handgun. Jenkins and his wife were at home at the time of the incident, but neither were injured, according to Jackson police. But the Jenkins’ living room and bedroom were destroyed, along with TVs, furnishings and memorabilia, WAPT TV reports. In the post, Duke said Jenkins' Jackson home was targeted because he is a police officer.